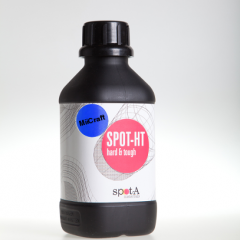 Spot-HT is our battle-horse resin at Spotamaterials. 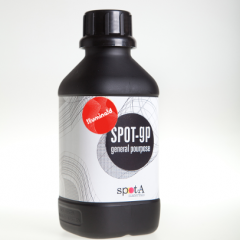 This is the product you will want to use when you need to print objects that have to be able to take a beating. 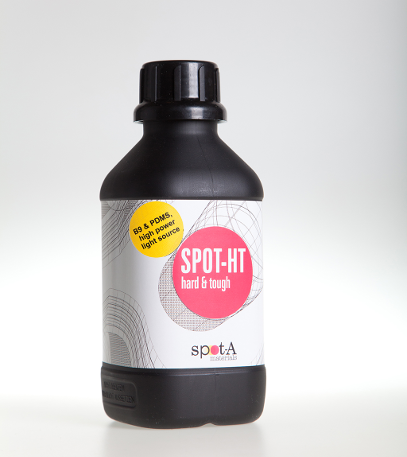 Spot-HT is our battle-horse resin at Spotamaterials. This is the product you will want to use when you need to print objects that have to be able to take a beating.Looking for extra hardness, toughness, impact resistance, abrasion resistance, weatherability, chemical and water resistance? 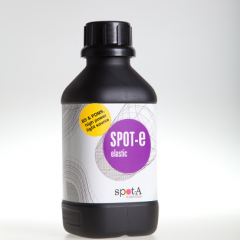 This is the one, this resin has been developed in collaboration with users that had a clear idea about the properties of the objects they had to produce. Be it objects that had to withstand above 100ºC (212 F) for a long period of time, to survive vulcanization processes, to shock resistance in order to resist being smacked to the ground, having little brittleness… the list of desired properties had no end. 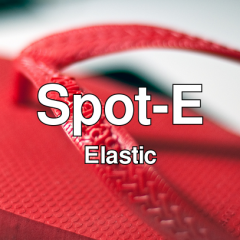 Spot-HT has already entered a good numbered of improvement iterations and development will be continued, to get every last bit of performance out of available chemistries, while keeping the cost accessible. High cure speed, minimizing health risks and keeping the viscosity low is also on the must have list, so these will also be maintained throughout every new iteration of the product.